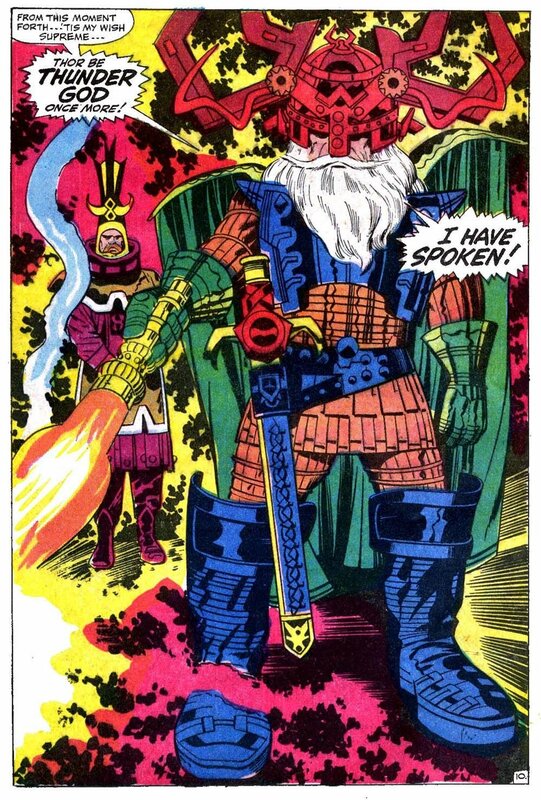 Understatement alert: Jack Kirby’s career was characterized by an excess of ideas. Giants of the Promethean Galaxy! An epic beginning with an epilogue! The pinnacle of that excess, I reckon, was the 1970s, when Kirby was writing, penciling, and editing his own work, allowing for an unrestrained and often unhinged flow of information in The New Gods, Mister Miracle, The Forever People, Superman’s Pal Jimmy Olsen, The Demon, OMAC, The Eternals, Devil Dinosaur, 2001: A Space Odyssey, and other products of mad mytho-science. 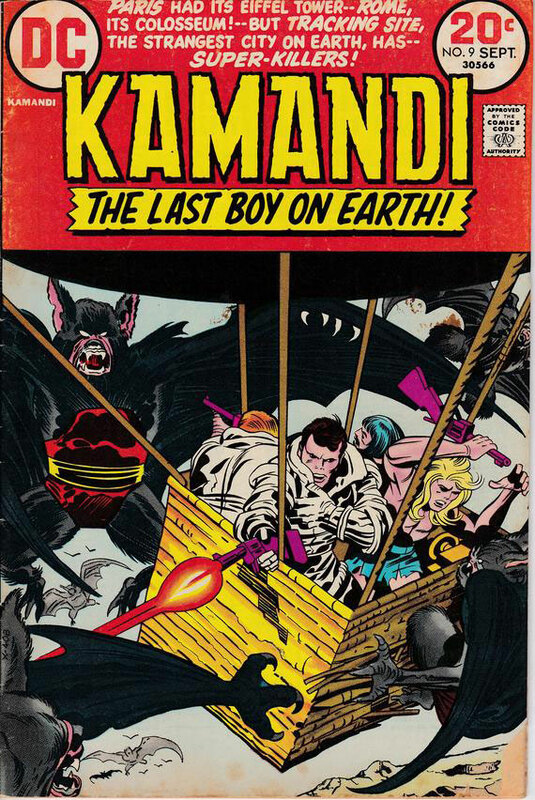 In Kamandi — Kirby’s most commercially successful DC book of the decade — our hero took a Planet of the Apes-inspired scenario and hooked it up to the Kirby idea machine. Only Kirby could imagine a scenario where a half-naked dude facilitates a truce between tiger people and gorilla people by using a slot machine from the ruins of Las Vegas (as happened in Kamandi #5). So let’s take an acid trip together down the rabbit hole of Kamandi #9, one of Kirby’s densest and wackiest issues, in which nearly every page drops a new and nutty notion in the lap of the reader’s mind. The first of these pounding heavy metal terrors are giant rabid bat people. 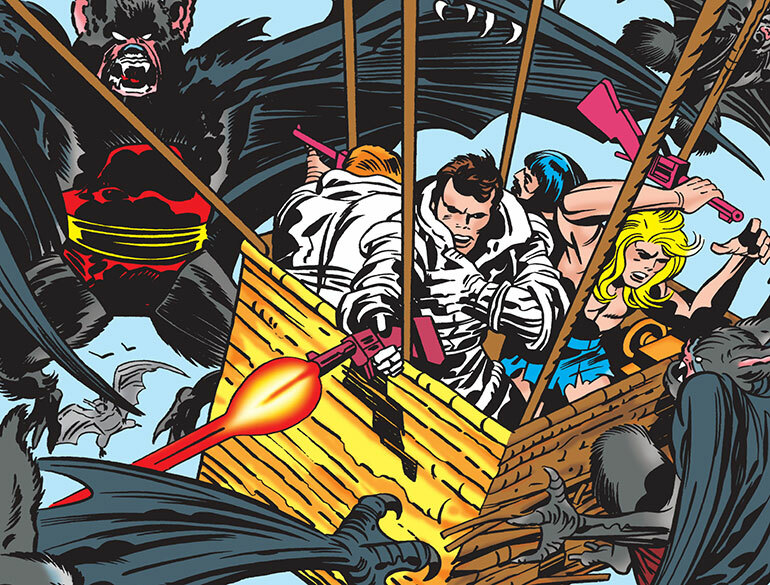 By page two, the bats have been dispersed and Kirby is onto the next thing: the Laseron, a type of space station in low orbit, manned by robots called Serviteks and home to Kamandi’s friends, some astronauts who are also Nuclear People. 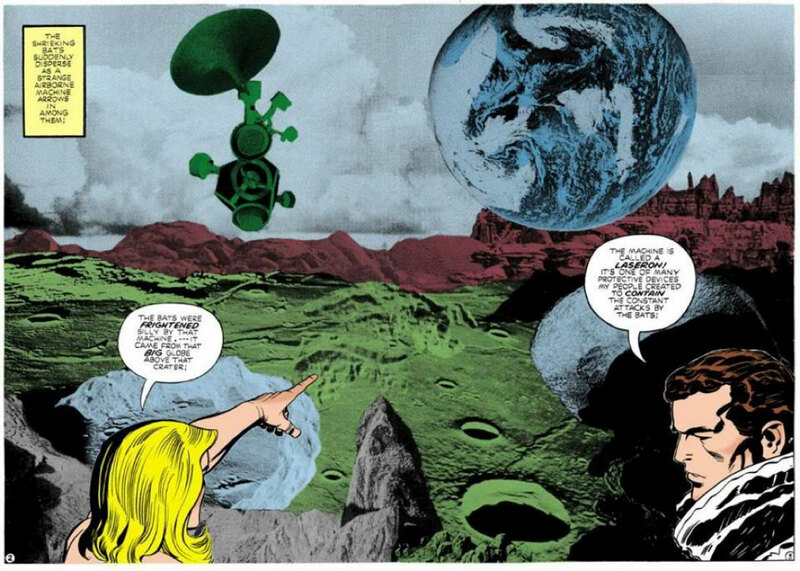 The Laseron is introduced via a classic Kirby collage. 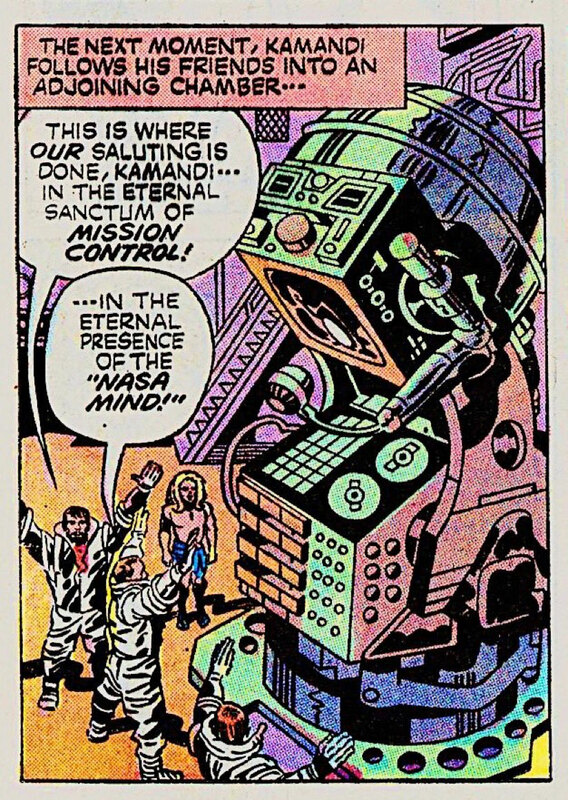 By page 8, the astronauts have introduced a bewildered Kamandi to the most Kirby idea of them all — the NASA Mind, which stores data from their spacesuits and seems to have some level of sentience. 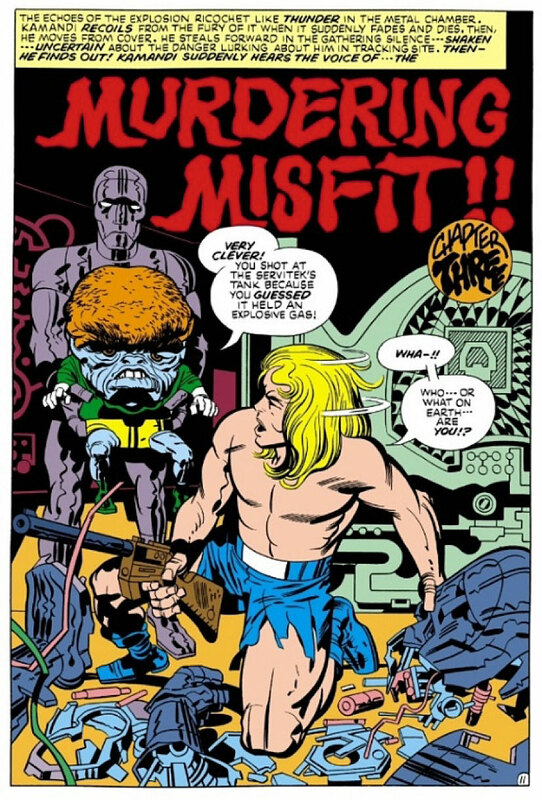 As Kamandi — and the reader — take all that in, we learn that the Serviteks are secretly under the telepathic control of a big-headed, small-bodied freak called The Misfit. He reminds me of a certain world leader, but I can’t quite think of who. Spoiler alert for a 1973 comic: here’s a better look at Morticoccus from issue #10. In a move I hope no parents emulate, Kamandi turns this preposterous piggyback ride into a collision of Misfit and electrical unit, which messes up the Laseron and brings back the bats, who fight the Serviteks in a brawl that could release Morticoccus. Does Morticoccus destroy all life on Earth? Tune in next month. 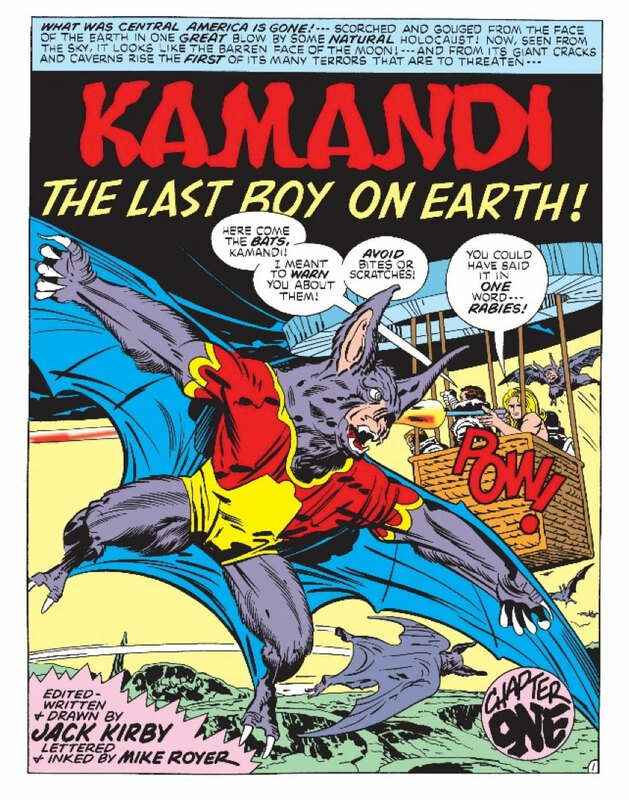 To sum up this buffet of batshit, Kamandi #9 includes bat people vs. astronauts, bat people vs. robots, a sentient NASA computer, a precursor to President Garbage Bag, and a germ that can destroy all life. For a normal comic book writer, just one of these scenarios could have filled an issue, arc, or series. Not for Kirby. He could never settle for one idea when eight would do. That’s what people are getting out of Supreme, in its examination of old stories—an imaginative energy. I don’t think it is the kitsch thing, or the cleverness of the re-examination. I think it’s the sheer energy of that hammering of mad and beautiful ideas. That’s Kirby, by god. I don’t know about you, but sheer energy, of any sort, is not something I have in great supply. In my daily battle against the bat people of America and the Morticocci of the mind, I need all the mad and beautiful ideas I can get.